Nursing myths busted by junior nursing major. Myth #1: Junior year nursing majors have no life. Fact: Junior year of nursing is a lot of work, but it’s not too bad if you don’t stress out about it. Nursing involves a lot of knowledge about the body, while also having skills that are required in the hospital setting. Additionally, we have to know the importance of compassionate and ethical care. So yes, there’s a lot of material to pack in to four years, making it seem like our lives are pretty hectic. All college students are busy though, so let’s not compare majors. Myth #2: Nursing majors wear ugly scrubs just to look cool. Fact: Most nursing majors feel just as crazy as they may look when they are wearing their scrubs or lab coats. The most horrifying thing is when we have a time crunch and have to enter the Rott wearing our “professional attire” (if that’s what it is). The night before clinicals, we head over to the hospital in our lab coats to assess our patient and their clinical manifestations. On clinical days, we work with our patients to get experience and knowledge in the real life setting, and on these days we wear our scrubs and stethoscopes. Myth #3: All nursing majors are the epitome of good health. Fact: I love sodium and cholesterol and trans fats and sugar. And some nights I don’t get enough sleep. And sometimes I don’t feel like working out. We don’t judge others for their health, because we struggle just as much as you do with eating spinach and doing pushups. Myth #4: The only thing nursing majors do is clean up poop. Fact : I don’t recall ever cleaning up any poop (yet). We do secretly compete for pretty gross jobs, like putting in a urinary catheter or cleaning bloody wounds. The other day I had to clean someone’s dentures. But, overall, we do better jobs, like taking vital signs and giving shots. Of course, as we get further along in nursing school, we get to do cooler stuff. 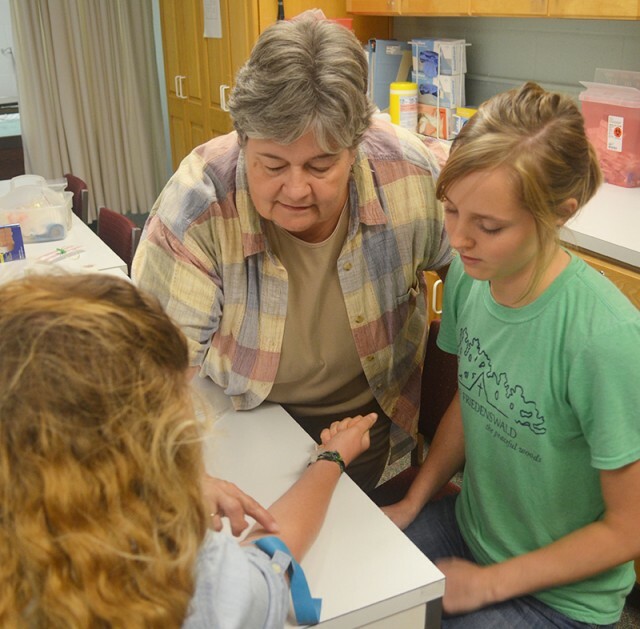 Myth #5: Nursing majors know everything about anything relating to health, wellness or injury. Fact: Sure, we know a lot of stuff – knowledge of medicine, skills, cognitive thinking, good conversation skills – but we also know how to make it look like we know stuff. So if you come to us with a health problem, we probably won’t kill you, but it doesn’t mean it’s the most accurate or appropriate treatment. And sometimes we just get nervous about making mistakes, so we say something to sound intelligent. We’re sure good at pretending we know stuff though, and it’s probably better to ask us than a music or physics major. Regardless of the myths or facts of Goshen College’s nursing program, I have grown to love and appreciate my challenging classes, caring professors, and crazy nursing peers. The nursing program at Goshen has taught me the importance of hard work and integrity, while also teaching me compassion for others and the importance of always being willing to laugh at myself. And really, if you ever do have a health concern, feel free to ask a nursing student so that they can at least try to help.